This teaching story could’ve been my story. The reason it’s worth paying attention to, is because it can help us remember what’s at stake as we keep putting one foot in front of the other on this winding road toward a child or another deeply desired destination. It’s really a story about why we must keep going, going, going especially when the going gets tough. There was something about the expression on the face of Teri Hart, a Canadian television personality, when she spoke about the six years she has spent in the infertility underworld enduring miscarriages, an adoption that didn’t pan out and an egg donation cycle at a clinic that got shut down– that was painfully familiar. a woman I never actually met, but one who had a pivotal role in my own story. Listening to Teri recount the troubling twists of her journey, I instantly recalled a similar expression of anguish I once saw at a support group I attended after the birth of my younger daughter. I chose to avoid those meetings when I was still in the midst of my own experiment. My faith in my self-healing protocol was much too fragile. I didn’t have sufficient inner resources. The energy of defeat in the group I had attempted to join, threatened to shatter the emerging hope. But after I gave birth, I needed a solid enough reason to sit down and write my story. Which is why I went back to those gatherings looking for something that would keep me writing. And I found what I needed in the face of the first woman that arrived at that mid- Manhattan conference room, took her place at the massive oval table, and kept reaching for her husband’s hand the entire evening. The expression on her face was that of deep disappointment mixed with equally deeply felt anger and utter helplessness. At the time I recognized that expression as an all too familiar reflection of feelings I myself have wrestled with so many times in my life. From then on, whenever I doubted whether writing my book made any sense at all, since no publisher deemed it worthy of putting to press, all I had to do is recall the face of that one woman at the meeting. It’s true that we are not able to control the outcome of treatments or the outcome of any journey toward an object of our desires. It’s true that doing everything we’re told we ought to be doing doesn’t ever guarantee a full term pregnancy. There are very few guarantees in the human game. But we do have the power to co-create as conception friendly a space for our creations as possible. We do have immense power of choice. At each step of the way we can choose how we move forward. We have the power to choose our companions for the journey. We have the power to choose the provisions we place in our backpacks. We have the power to choose how to build our inner resources and at some point recognize ourselves as co-creators of our lives. Not because we want to blame ourselves but because we want to claim whatever power we are able to claim. Six years of treatments, an adoption that fell through, egg donation with a clinic that was shut down? What can we learn from this heart-halting story? The readers of this blog know that I’m not “against” anything. Not against IVF, or surrogacy, or egg donation, or embryo adoption or anything else. But the manner in which these choices impact our lives depends on how we use them. in which case we will resort to any means to force them to come up with desired results. In that scenario, IVF becomes a self-punishing weapon. Or we can view our bodies as allies trying to shield us and our future children from harm and trust that they have a good reason to behave as they do. No, we humans are not the controllers of our lives. Not controllers, not Gods, but vulnerable, fragile and at the same time unconquerably resilient creatures. Our resilience is rooted in a humble partnership with our bodies and some Mystery breathing through us. A Mystery that orchestrated our own coming into the world and if we can stay the course, will do the same for our child. It’s not about the number of years we spend travelling toward our creations. It’s about learning the difference between forcing an outcome and allowing something to be conceived and born through us. It’s about making sure we get the support we need in order to keep walking a road of self-discovery rather than a road of suffering. Then we can reach our destination as did Sharmini, or Chaim, or Meghan, or Anna through becoming our own and our not-yet-born children’s strongest allies. Anything that strikes a chord in this story? I just had this huge AH-HA moment I had to share. Anyone out there watching “The Handmaid’s Tale” on Hulu? I’m only 3 episodes in, but it does have a lot of infertility triggers, so I’m treading lightly. There is one part of the show when the main character might be pregnant (summary: the main character is basically a concubine in this dystopian future where most are infertile and those who aren’t are “owned” by the rich and powerful to help them and their infertile wives make babies). The wife, who before treated the other woman like garbage, suddenly began showering her with affection, attention, kindness, compassion, sympathy, understanding and even love. But once the main character gets her period, the wife spins a 180, literally throws the woman into her bedroom, screams in her face, tells her things will get a lot worse for her and pours hate and disgust out of every pore. I’m sitting in bed watching this, thinking “What a horrid woman! Why can’t she understand it’s not Offred’s fault? She can’t make herself get pregnant. Have some understanding! And with all that pressure? You think it’s going to happen? Why can’t you just be nice to her like you were when you thought she was pregnant? Why are you only nice to her when she’s possibly pregnant? Is that she’s good for?” Then, the ah-ha: I DO THIS TO MYSELF!! I’m the commander’s wife in the two-week wait. Then, my period comes and I’m still her, but the mean version. And my body is Offred. Wow. Clear as day. Julia, I can relate to your story of going to a support group and being so affected by the panic and fear in the other women’s faces. As Teri says in the video, our society is terrible at dealing with fertility issues – fear and panic are the standard response to anything we aren’t able to predict or control. I’m so grateful to have found the Fertile Heart work, and to have a tool kit that allows me to see opportunities for growth and healing rather than despair. 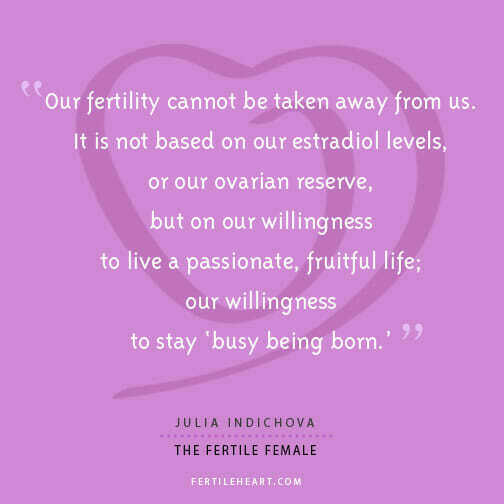 Our lives are full of so many beautiful blessings, we can’t let our fertility struggles consume us. I find that more and more brave women are coming forward with their personal journeys. It isn’t just celebrities. It seems to be happening all the time around me. The loss, devastation, anger, sadness and hopelessness is so palpable in every personal story. It is always difficult for me because my inner orphan and all the inner pieces of myself who vividly remember those emotions attach to their words and emotions. I feel the panic and desperation start to creep up and so I find that my orphan screams at me to just walk away, don’t listen, but yet I can’t. 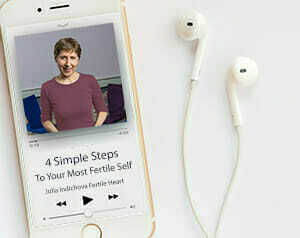 I listen and I care and then I share about Fertile Heart. My visionary rooted strength just bubbles up. Hope just feels so much nicer than panic and desperation. Learning how to hear, feel and hold onto my hope propels me to support others to find their own path of hope. What has been most remarkable to me is that I find when I am supporting and encouraging others who have come to me with their stories is that my voice, my words are all things that I need to hear too. I cannot help them without also helping myself. I always fear being sucked back into panic and desperation and it does happen. But I am stronger now. I can see it, feel it, hear it and calm it and I CAN MAKE A CHOICE. Every day. My faith is still fragile. But this is my body, my life, my choice and I know I just need to keep walking, keep listening, keep healing. I know all of this because of your unyielding support and guidance. I could not be where I am today without your books, you and our visionary mamas’ support. Have a healing circle who are all moving toward hope, faith and individual choices is so very important. We all cling to that golden rope you’ve taught us about. The rollercoaster ride may not be over, but the valleys aren’t as deep and the view from the top just keeps getting clearer and more beautiful and I always have the choice. Keep riding? Or get off. Thank you Thank you Thank you dearest Julia. It’s interesting, as usually I find a response to Julia’s blog posts comes easily to me. Yet with this post, I’ve found it hard to respond. Probably because listening to Teri Hart speak, I can hear aspects of myself, hear my own orphans, and that makes me uncomfortable. I also think it’s very good (and brave) she is being so open about her journey. The times I AM able to trust in the Ultimate Mom, to trust there is guidance out there, and that we are co-creators, are the times I am able to relax into the journey rather than fight it. I find that these times come and go. As others have mentioned, I also have to keep reminding myself that my journey is my own, and no-one else’s, so there is no point aligning myself with others’ stories as we are all on our own paths. I hadn’t read this blog when I spoke in the circle the other night about my fears of reading an article in a magazine where another celebrity had had many failed IVF cycles. I don’t know any great details about why they didn’t work for her, but reading about it stirred up a fear deep in my belly that I wasn’t expecting. And as you so wisely pointed out to me, I’m not her – this is my story, my journey…a journey that I am co-creating, not one where I feel vulnerable, panic stricken and forced into making decisions. It’s funny because what I am experiencing now after finding you is completely different to what I was feeling two years ago when I was doing exactly that. Just now, I was lying down relaxing after doing my yoga dvd; the same yoga dvd I started two years ago, when I was embarking on ivf at my old clinic. I paused for a second and remembered how vulnerable, panic stricken and forced I felt at that time. Boy was I desperate! Unsurprisingly that IVF (my first attempt) was cancelled by the clinic. On reflection it was all wrong! Truly driven by hopelessness and desperation. It’s only now that I recognise that because it’s polar opposite of how I feel right now. I have truly grown with your work. Your writing about choice in this blog resonates most with me. Throughout my time at my new clinic, who specialise in natural IVF, I HAVE made the choices. This has empowered me immensely. I HAVE listened to my body and what it needs, I HAVE decided when I want to move to the next step, I HAVE learned to trust myself. Even now, I HAVE carefully made the choice when I feel ready to go for implantation. I could have done that two months ago but I listened to my body and KNEW that I still needed time to heal. I KNEW that I needed a break from the clinic and all of the scans and long car journeys back and to. I KNEW I was a little burnt out and had too much going on in my life. I KNEW that I would know when I was ready! And now Julia, I am ready. Everything about the next part of my journey feels extremely natural not one bit forced. I am truly thankful that I found your work. Hi Julia: I’ve been away much these past two months. So much going on in life, and just a need to step away from all the baby chasing. I see stories like Teri’s and a large part of me sees it as totally normal. But that’s the orphan part, because I also see flaws in that theory. I can see where she chose one path over another because I do it a lot. It’s hard to see people who really shouldn’t have kids (either physically or morally) have kids. It’s hard to hear someone who had older parents say it’s the worst thing ever to happen to a child. It’s hard to see that nothing you do to better the situation makes a difference toward a take-home baby. But it’s most hard to be thrown about at the mercy of my orphans. I keep reminding myself that other people’s reality is not mine. I remind myself that some people who have babies late in life might not exactly plan on or want that, leading to not the best parenting practices. But people who struggle and fight and stay on this journey for years know the miracle that children are, and are very unlikely to be crappy parents who have kids who regret being born later. I’m learning to be open to possibilities as my birthday approaches. I’m understanding that I’ve wanted more children for years and it’s bigger than just wanting to birth a child or nurse a child. It’s my desire to PARENT more children that keeps going. A part of me (the orphan part) thinks that Teri’s ending will be mine, too, in a way. I’ll always be carrying around the loss of not having what I so desperately want. But then again, I know this practice is about choosing which path I want to walk down. So I’m going to work on that as yet-another birthday approaches. I have just a sliver of hope left, but at least I still have some. I’m ready to walk the walk and not just think about it in my head. I’m hoping then it will all click in to place. First of all felt so sorry when I heard Teri’s story. I could so much relate to her anger & helplessness. I have been there and I still am on many levels. Then I was also shocked to hear that infertility is something so many couples are faced with these days. At the same time it is something not really talked about openly. It has some sort of stigma to it, people feel embarrassed as if something is wrong with them. Some time ago I would have never talked openly about our challenges but I can do that now without feeling faulty or breaking into tears. And I realised that I have come a long long way. And I keep on walking. This work is such a blessing and Julia you are a great healer! I am so grateful for your work. This was a difficult post for me – which means it hit a cord and I need to stew on it. When do you stop or keep going and going? When do you embrace your current situation because this is your truth or when is it giving up? Julia, what resonates with me is one of the things you said in the Visionary Mom call – no matter what decision, it comes from a place of strength rather than fear. Yes! And I understand now (in my bones) that power of choice. Thank you. It was really striking a chord when she was saying “we need to be better” (as a society about asking women if they are having children or when they are going to have kids. She was saying how hurt it is to be asked that by seemingly unknowning or unfeeling people. I have come to realize in my journey how much that question would set me off. Sometimes I loved giving people the real reason just so I could watch them wilt and feel like crap for asking it. However what I know now is I really just wanted to be heard. I think my O was pissed off for “having” to keep infertility a secret. She was pissed off other people had it easier and could get pregnant without really trying. She was really pissed off if she did open up they would not understand or just brush it off as – well too bad…or you are too old…or should of started trying before. Not being heard feels so hurtful. However keeping my O bottled up inside was way worse. I realize now I do not need their approval of my journey. I do not need their opinions about my age or past failures. I just need to keep my visionary pointed in the direction of my desire. My desire to be a mom. Dear Julia. This blog post I found hard to comment on. There are many things in here that I can relate to. Both my orphans and visionary find their thoughts echoing as you relentlessly show us with your actions and words how to militantly be on our own side. I feel the same shame, sometimes helplessness as Teri- I feel for her and hope she finds healing. Often I find myself not convinced that I need IVF to conceive our baby but more so, I see Teri in my husband- who refuses to acknowledge any value in this work nor pursuing a non ivf option. So I often feel more sorry for myself than anything else. I have the tools to help myself. I’m finding my way. I pray for patience and perseverance and courage to everyone on this path. Hope we can be compassionate towards our partners and to ourselves. I started watching that video and I wanted to stop but I made myself watch the whole thing, It was like watching the me I was ages ago. Like I remember how that person felt and I have a lot of sympathy for her, but I’m not that person today and there is no going back there for me. I realize that in some way I’ve been taking for granted how different I feel since doing this work. I feel a lot like Barbandbabe. Hope that makes sense. So I’m grateful for the FH work and I don’t want to take it for granted, but I’m also glad that it feels so natural to be in this different place about it. Thank you Julia for a great post to help me put things in perspective. Thank you for this blog, Julia. I have been working with Wailing Wall Fertile Heart body truth and Meeting Your Child Halfway Fertile Heart imagery. I am frustrated now because I have taken an intensive course hoping to find a job that does not require Saturday evening and Sunday wok, only to find there are a lot of jobs in this field I have been training for that require Saturday evenings and Sundays. I’m hoping to find some in the field that don’t require these days. I have had a few interviews and hopefully everything will go well. That’s part of my fear is feeling I need to settle for days I /hours I don’t want to be working in order to get a job. I am finding it challenging now finding the time to take care of myself like I really want to because of all the applying and interviewing. What a fascinating post, and your comment, Barbandbabe, really encapsulates what strikes me about this, which is the absolute, unswerving confidence that the FH approach ‘works’. Not that it necessarily means that we get pregnant next month or even next year, but that our journey will take us to meet our baby halfway, whenever and however that occurs. Julia’s confidence, in this post, that she could have helped Teri Hart is both inspiring and touching. This blog couldn’t have come at a better time for me because it showed me how far I’ve come in not even a month of doing this program. That video of Teri Hart would’ve been a lot scarier for me to watch if I had seen it before I found you. It’s exactly how I felt I was going to end up, with no baby and like nobody gets me and nothing’s going to work anyway so why bother. I’m in such a different place now, this work is a total game changer for me. I have no idea where I’ll end up, but I know something I didn’t know last month. Teri’s story is not going to be my story, because I have what I need now and there is no way I’m stopping until I “meet my baby halfway.” I can’t thank you enough Julia for this blog and for changing my whole mindset on this and just for everything you have given me.